The First Art-Ball, the "Ball of Nations 2002" was exhibited at the FiFa World Cup 2002 in Seoul, Korea. Eight artists from Chemnitz, Germany had painted the 32 parts of the Art-Ball symbolizing the participating nation. 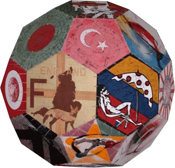 The "Ball of Nations 2006" was the second Art-Ball created by 25 artists from 12 countries. This Art-ball was exhibited during the FiFa World Cup 2006 in the Museum of History in Hanover, Germany. The Summer Ball was the third Art-organizers and guests of the annual "Brickyard Party 2006" Organized by the Brickyard Studio in Ventschau, Germany. The SPICE Art Ball was Art-Ball No 4 (and the first of the SPICE network) it was created by members and artists in 40. The SPICE Art Ball has been presented in 13 countries on three continents. For or a complete overview and access to pages with photos and videos, please visit page "Keep the Ball rolling".